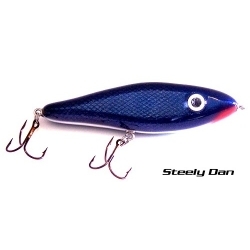 The Dunwright TOP Dancer is a new look in top water " walk the dog" style baits. It has a shape unique to this category of baits. This shape gives it a action equally as unique. A short snap of your pole ( giving back slack line just as quickly) will make the TOP Dancer swirl 180 degress. As it swirls the tail makes a noisy splash and the TOP Dancer roles on its side as it turns.